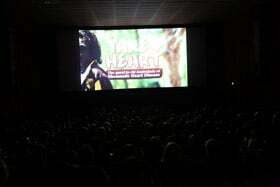 Take Heart hit the big screen at BCC Cinemas in Darwin last Thursday night where over 200 people turned out to support the launch! There weren’t many dry eyes left in the house when the lights came up, as sadly this film highlights a serious illness that has touched the lives of many in the Top End. However the good news is that Rheumatic Heart Disease is 100% preventable and the more people learn about what causes it, what symptoms to look out for and how to stay on track with secondary prophylaxis once prescribed, the better off they will be. This knowledge empowers Take Heart‘s audiences to keep their children and families safe from a simple Strep infection progressing to Acute Rheumatic Fever and thereby reducing the rates of Rheumatic Heart Disease. That is what Take Heart is all about, helping all Australians understand this disease and how to prevent it. Take Heart outreach includes a traveling photography exhibition (see the exhibition here) and an Action Toolkit. It was a thrill to finally see these tools in action. We kicked off with the photo exhibition on display in the lobby of the Royal Darwin Hospital where it received a great response. Dr Bo Remenyi, Paediatric Cardiologist was present to answer any questions raised by people stopping by to have a look. We handed out post cards with important messages on RHD prevention and had a very warm response from those who took part. We then moved on to the Menzies School of Health Research where RHD Australia had placed the photo exhibition up in the communal lounge for staff to see and learn more. The Take Heart Short Film Closing the Gap on Rheumatic Heart Disease was screening in the Auditorium as part of a Close The Gap Day event. The Quest to Rid the World of Rheumatic Heart Disease really isn’t going to become reality without the buy in of our politicians, and a good step in bringing them on board was when The Honourable Adam Giles MLA, Chief Minister of the Northern Territory held a reception in honour of the launch of Take Heart. It was fantastic that James Gurruwiwi and his daughter Brooklyn (both feature in the Take Heart feature film) attended and James spoke of his personal experience with RHD as Brooklyn had open heart surgery at just seven years of age. The film was shown but James personal testimony really hit home just how serious this disease is. The following day, at Marrara Christian College, Take Heart‘s Outreach Sponsor Bupa presented teacher Tom Leach with the Take Heart Action Toolkit to use in the school’s health & wellness curriculum. Liddywoo Mardi, an 18 year-old with RHD who is featured in Take Heart was presented with his graduation certificate and a Dreamtime Essendon AFL Guernsey signed by his hero Michael Long. He then spent some time with a group of current students as they learned about Rheumatic Heart Disease and how to stay safe from Strep germs. The school had put the photo exhibition on display, they watched the Take Heart short film Important Heart Message: Acute Rheumatic Fever and used the Action Toolkit Guide. 1. What causes Rheumatic Heart Disease? 2. What are the symptoms of Acute Rheumatic Fever? 3. When should you go to the clinic to get checked? This kind of education is vital in reducing the rates of Rheumatic Heart Disease. If you are in an affected community you are eligible to receive a free copy of the Take Heart Action Toolkit- please register here to get your copy and start helping your community prevent this disease. We’re looking forward to sharing more on our Take Heart Outreach journey to the Tiwi Islands in next week’s newsletter. Sign up here if your not already!